What exactly is a Zac Efron? I’m confused. This is the same type of confusion that I experienced with “High School Musical.” Now I’ve never seen it, so maybe that’s part of it, but I don’t understand exactly what High School Musical is. 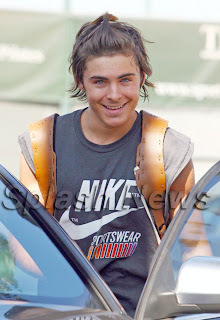 Then, I find out that Zac Efron was actually in High School Musical and I don’t understand exactly what a Zac Efron is. Coincidence? Doubtful. This is the type of celebrity that I like to refer to as “The Bermuda Triangle Celebrity.” It’s not that because the celebrity disappears, but because my thought process disappears when I see them. Oh, and it has a little to do with the fact that with his hair tied back like that he looks a little like Amelia Earhart. Little kids seem to love Zac Efron and Zac Efron kinda looks like he’s about one more ponytail away from “loving” these little kids right back.